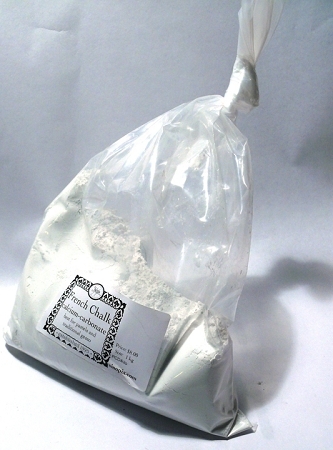 Calcium carbonate for making gesso and pastels. Extra White Grade for bright white gesso grounds. "The whiter the chalk is, the greater its value; therefore French Chalk is the best." Max Doerner. Q: My question is the Franch Calk ans Calciam Carbonate is the same thing or they are diffrent from each other? A: Yes, French Chalk and Calcium Carbonate are the same thing. Q: Would this be good for water gilding to get the best burnish? A: Yes, this chalk would be the ideal calcium carbonate to mix with rabbit skin glue, for a ground that can then receive layers of bole on top. Q: What does PCD stand for, and is this precipitated chalk? A: PCD is our product code and has no meaning beyond that. It is not precipitated chalk. Q: Is there a difference between French chalk calcium carbonate whiting and powdered marble dust calcium carbonate whiting? A: They are both Calcium Carbonate. The French Chalk is a bit denser in consistency, but both are used interchangeably for traditional gesso applications. The Marble Dust lends itself as a better filler in paints and plasters. Q: French chalk is talc or talcum powder, which is magnesium silicate, isn't it? I'm confused that this French chalk appears to be identified as calcium carbonate. Is French chalk a term used for both different minerals? Is talc used in gesso? A: The talc based French Chalk is a term commonly used in the tailoring industry and that is why it is showing up as the more common usage. Dörner calls a pure white calcium carbonate powder French Chalk and that is the definition that we use for our pure calcium carbonate French Chalk. We do not recommend making gesso with talc powder.